Pictures and videos from Rannvijay Singha's daughter Kainaat's play-date with Kareena Kapoor's son Taimur in London went crazy viral last month and the Spiltsvilla host told news agency IANS that despite the media attention, he and his wife Priyanka Vohra try and maintain a balanced life for their one-year-old daughter. "So much has changed over the years, there is more and more media everywhere you go, but we try to maintain a balanced life for Kainaat. We are grateful to our friends in the media fraternity who have been kind enough to understand and maintain our personal space," Rannvijay told IANS. In London, Kainaat and Taimur (she apparently calls him "Timbur"), accompanied by their respective mothers, met at the London zoo. Several pictures and videos (some shared by Priyanka on her Instagram story) found their way on social media and trended for days. Earlier this year, Saif Ali Khan told NDTV that he and Kareena Kapoor expected this kind of reaction from the media when Taimur was born. "Kareena and I knew there would be media interest in our son. 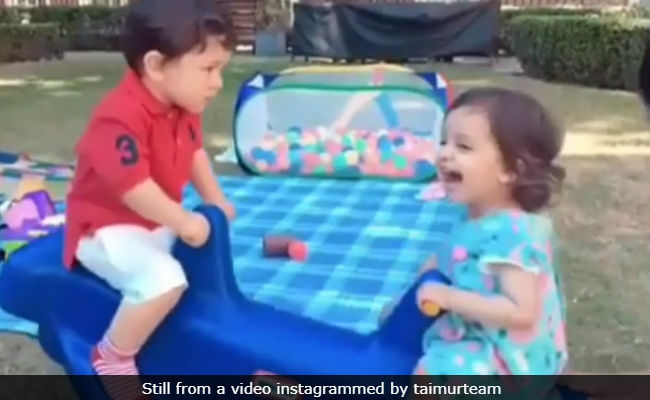 It's hard to bring up kids without the attention; I don't know how he is going to react to the attention when he grows up... Taimur has just started his life. It's important for us to make sure he grows up to be a balanced person. Hopefully, he will get used to it; I don't think he knows any better. He knows there are cameras pointing at him all the time," Saif said. On the work front, Kareena Kapoor was last seen in Veere Di Wedding and she hasn't announced her next project yet. Saif Ali Khan received critical acclaim for his role in Netflix's Sacred Games and he's awaiting the release of Baazaar. Rannvijay is currently busy filming reality TV show Splitsvilla Season 11, which he co-hosts with Sunny Leone.